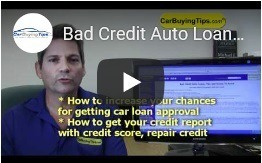 Bad credit car loans are a specialized product for individuals that need to buy a new car but have less than perfect credit and are unable to qualify for prime car loan. If you have bad credit you should get your finances cleaned up before buying a car. Sometimes you can't wait long enough for your score to improve. In this case, we will educate you on how to get the best deal possible given your situation. Lies about the lender "requiring you" to buy an extended warranty, credit life insurance, etc. If you have bad credit, I bet many of the scams we describe have happened to you. You can expect to pay a very high interest rate (much higher than you should have paid). The dealer may lie to you about the lender "requiring you" to buy extras. These extras may include an extended warranty or credit life insurance. Many times they lie to you about your credit score and tell you it's lower than it really is. If your credit score is too low to qualify for financing, this opens the door for a classic dealer trick! They require a co-signer for you to buy the car. However, they trick your co-signer into being the borrower with a little sleight of hand during the paper signing. Since you have bad credit, the dealer thinks you are uneducated and will fall for all of their tricks. If they are correct, it could devastate your financial future. We will teach you what to look for and how to avoid getting ripped off. Protect yourself by reading the entire page. You need to know the current state of your credit history (good or bad) before visiting the dealership, so you know the interest rate you should be paying. You can check your credit report and score online by visiting TransUnion or Experian.com (you get your 3 credit reports and 3 scores by Experian instantly online, with enrollment in Experian.com). If you have bad credit, you'll never ever get the 0% financing that you see in ads. Applying for financing without knowing your credit score is one of the biggest mistake a car buyer can make. Click here to use our loan payment calculator tools to play on even ground with car dealers and verify their numbers to make sure they are not payment packing your loan. If your Credit Score is < 600 or you don't have a past history of auto loans, don't submit loan applications that get rejected, dropping your score even further. 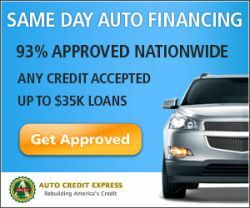 Apply to Auto Credit Express, they work with multiple lenders. They may be able to get you car financing from one of their high risk lenders, with decent online rates, even with a bankruptcy. If your score is > 550, $1,500 or more in monthly income, full time employment, Auto Credit Express should be able to help you. Many people with bad credit make this mistake. If you know you are paying 18% APR, then forget about adding items like warranties and insurance into your loan. Why pay the high interest on those too? That just digs you a deeper hole. You can buy those things after the fact directly without the car dealer markups and high APR. We hear from our visitors all the time who traded in a car they owed money on and a couple of months later were shocked to hear the dealer did not pay off their car loan in ten days as promised. With this scam, when the bank calls, you are responsible because the old car loan is in your name, and the dealer didn't pay it off. If you trade in your car that you owe money on, make the dealer put in writing that they'll pay off your car loan in ten days, or no deal. Straw Purchase Loan - When You Have a Co-signer! With car buying, a straw purchase is when the dealer tells you that with your bad credit, you can't qualify for the auto loan so you need a co-signer. The co-singer is duped by the dealer and the loan ends up in their name! This will not help restore your credit. To Avoid The Scam, have both signers at the dealership so both signatures will be done together. In this scam the dealer will call you several days after the deal is done and tell you that the financing fell through and you will need to pay a higher interest rate. Avoid this scam by not financing through the dealership whenever possible. You can improve your chances of getting approved tremendously by raising your credit score. Unless you absolutely must by a car right now, take some time and try to pay down your balances as much as possible and try to get your score above 600. You may still be considered to have bad credit but will be much more likely to get approved. Once you have improved your situation save up some money to put at least 20% down on the car so you won't be upside down. If you are, it sets you up for a common dealer scam in the future where they offer to pay off your current loan so that you can upgrade. The trick is that all they do is put your old loan amount into your next car's monthly payment and you end up paying for two cars but you only own one. Get your Credit Score so dealers can't lie to you about your score. Close old unused credit accounts. They drag down your credit score. Be prepared to compromise on the make and model of car that you will be able to purchase. If you have bad credit, the most important thing is to get financing. Sometimes the dealer can only get you approved on a limited selection of cars. Once you pay off this car and have made all your payments on time, it will help raise your credit score. When your score improves enough, the next time around, you will be able to get the car of your dreams. "Thank you for all the wonderful information on your site. Keep up the great work! " - Tom J. When you are considering purchasing and extended warranty for your car there are some important items you need to look for. Read our comprehensive list so that you make sure you get the coverage you are paying for.